Sturm, James, Andrew Arnold, and Alexis Frederick-Frost. Sleepless Knight. Graphic novel. First Second, 04/2015. p. $14.99. 978-1-59643-651-0. OUTSTANDING. GRADES K-3. A young knight with a trusty horse sets off on a camping trip, only to discover that the knight’s favorite teddy bear has disappeared, and the help of forest animals must be enlisted to find the lost bear. This beginning graphic novel from the creators of Adventures in Cartooning (Sturm, 2009) features large, boldly colored illustrations, spare but engaging text, and hilarious facial expressions on the characters. The picture book trim size will attract readers who may not have tried graphic novels previously, and the simple yet action-packed story will demand repeated readings. 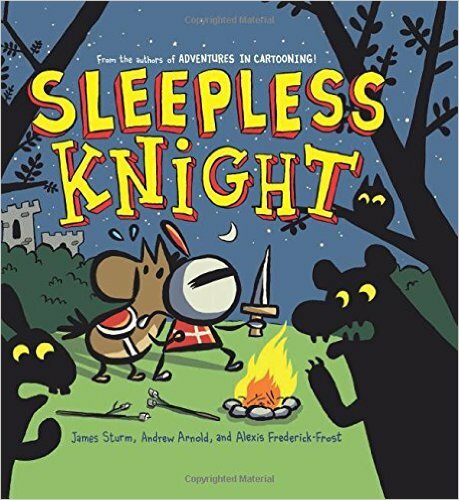 The knight’s appearance, deftly rendered as a stick figure with a helmet, is both gender- and ethnicity-neutral, so the universal feelings of loss, fear, and bravery will resonate with most children. This book will be a hit with graphic novel fans and those new to the format. Endpapers have instructions to draw the knight, horse, rabbit, and bear.